The German chipmaker is being acquired by a Chinese investment fund at a hefty premium. What: Shares of German chipmaker Aixtron SE (NASDAQ:AIXG) surged on Monday following news that the company had received and accepted a buyout offer from a Chinese investment fund. At 11:30 a.m. EDT, the stock was up about 12.5%. So what: Fujian Grand Chip Investment Fund, which is 51% owned by Chinese business man Zhendong Liu and 49% owned by Xiamen Bohao Investment Ltd., has agreed to pay 6 euros in cash for each ordinary share of Aixtron. This price is 50.7% higher than the three-month volume-weighted average share price prior to the announcement. The deal is valued at 670 million euros, or about $750 million. The transaction still needs to be approved by regulators, and it requires a 60% acceptance rate from all of Aixtron's outstanding shares. According to a statement the company made to The Wall Street Journal, the goal of the acquisition is growth. "Aixtron and FGC view the transaction as an opportunity to grow and to expand the company and its workforce -- the transaction isn't directed toward cost or staff reductions." 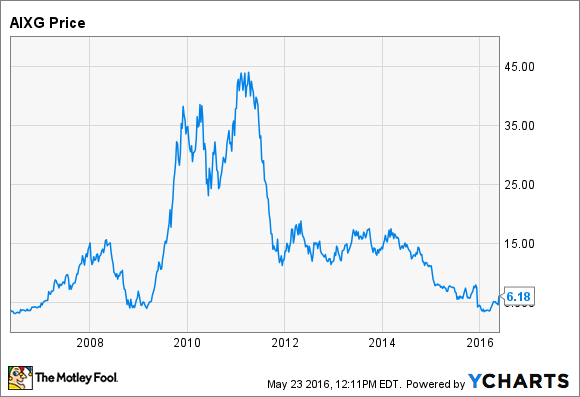 Now what: Shares of Aixtron have plummeted since peaking in 2011. The ADR surpassed $40 per share at its peak, only to tumble below $4 per share earlier this year. After the deal was announced, the ADR traded for around $6.15 per share. Aixtron is not the first case of a European company being bid on by a Chinese company. Last week, Chinese appliance maker Midea Group offered $5 billion for Kuka, a German robot maker. And in February, Swiss seed company Syngenta agreed to a $43 billion offer from China National Chemical Corp. The deal for Aixtron is the smallest of the three, but it's unlikely to mark the end of this Chinese acquisition spree. What Does Wall Street See for Aixtron SE's Q2? Does The Street Have Aixtron SE Figured Out?